A few months back, we had 26 different corded and cordless oscillating tool models in-house for our Multi-tool Shootout Review. A good time was had by all, and we got a pretty good handle on what the lay of the land looks like for the oscillating tool market. After the results from the shootout publish, we like to circle back around and take a look at the individual results. Today, we’re looking at the cordless Rockwell Sonicrafter oscillating multi-tool. We’ve already seen how its corded counterpart performed, so, how does the 20V Sonicrafter stack up? Rockwell’s cordless Sonicrafter is a good tool for DIYers that want to go cordless. It’s going to fall short of what Pros are looking for, though. We won’t see any difference between the cordless Rockwell Sonicrafter and the corded version, as they both use the brand’s Hyperlock system. This system allows for tool-free blade and accessory changes. To change out the accessory, you’ll flip up the lever on the back of the tool, and spin it around like a hand crank. This loosens the bolt that holds the blade in place. Because of this tool’s Universal Fit System, it can accept accessories from other major brands. This system works pretty well, and the Hyperlock system provides 1-ton of clamping force to hold the blade securely in place. We still prefer the Bosch/Fein Starlock system, but really, anything that doesn’t require a hex wrench to manage a simple blade change makes sense for us. Again, we’re not going to see major differences between the corded and cordless models here, but there are differences. As a general rule, cordless tools weigh a little heavier than corded models on account of the added weight from the battery. Not so, in this case. In fact, the 20V cordless Rockwell Sonicrafter weighs in at a very respectable 3.06 lbs, which is about a quarter-pound lighter. The form factor, however, is almost identical. They both have reasonably comfortable handles that feel good to hold onto, due to the general design and rubber overmolding. Here’s where we start to see the differences between the two models. The corded Sonicrafter has a variable oscillation angle that allows for up to a 5° angle of oscillation. This makes for an aggressive, fast cut. We also liked its lock-on switch for our longer cuts. Rockwell does not include this feature here, and instead, they’ve opted for a more standard 3.2° angle of oscillation. This translates to a slower cutting speed, even with the Sonicrafter set to max on the variable speed dial. Incidentally, the cordless Rockwell Soncirafter can crank out anywhere between 5,000-20,000 OPM. Vibration control with these types of tools goes a long way. Because multi-tools oscillate at such a fast rate, the vibrations caused can become uncomfortable with prolonged use. We appreciate it when manufacturers put some effort into vibration dampening, and Rockwell does an adequate job with the 20V Sonicrafter. We tested some models where the vibration felt almost nonexistent, and we tested some models that shook us to our cores. The cordless Rockwell Sonicrafter finished in the middle. We also appreciate some effort put into noise dampening. We won’t go so far as to say that we resent Rockwell for their lack of effort in this department with this model, but at 104 dB(A), we’re not crazy about the fact that the cordless Rockwell Sonicrafter just about made our ears bleed. With a set of earplugs, the noise shouldn’t bother you too much, but it’s worth mentioning that this was the loudest model we tested. The cordless Rockwell Sonicrafter offers a pretty great value at $125.87 for the kit. It has a good blade change system in place, as well as some pretty decent ergonomics. A three-year warranty, along with an included battery and charger don’t hurt either. The cordless Rockwell Sonicrafter finished our shootout in an overall 21st place. Admittedly, this isn’t the most flattering place to finish. It’s not a total wash here, however. As stated earlier, the Hyperlock blade change system works very well, and it’s lightweight and easy to handle. Its performance is perfectly adequate for most tasks. But for the Pro who uses a multi-tool pretty regularly or for long periods at a stretch, you’re going to want to look elsewhere. 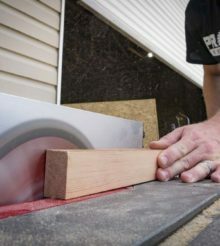 Ultimately, the 20V Rockwell Sonicrafter makes for a solid DIY class oscillating tool.